The upcoming week will be a wild one for many of us as we prepare for Thanksgiving Day. Clean the house (or just throw everything in a couple of closets and put a bear trap in front of them! ), polish the silver (or just stand at your front door and dispense those eye drops the optometrist uses to dilate your eyes so no one can see the tarnish! ), iron the linens (or come up with a convincing story that wrinkles are the new smooth), stuff that turkey (ick! gross! ), get yourself looking gorgeous (see ironing lie above), and create the Thanksgiving table of your family’s dreams (no, seriously…you really have to do this!). A lot of work indeed, but it’s the NEXT day you really need to concern yourself with: BLACK FRIDAY!!!!!! You can only fit four girlfriends in your SUV and still have room for all the packages, so this table is set for five in the library. Lots of bright colors will rev you up after a morning of guerrilla warfare shopping for bargains. 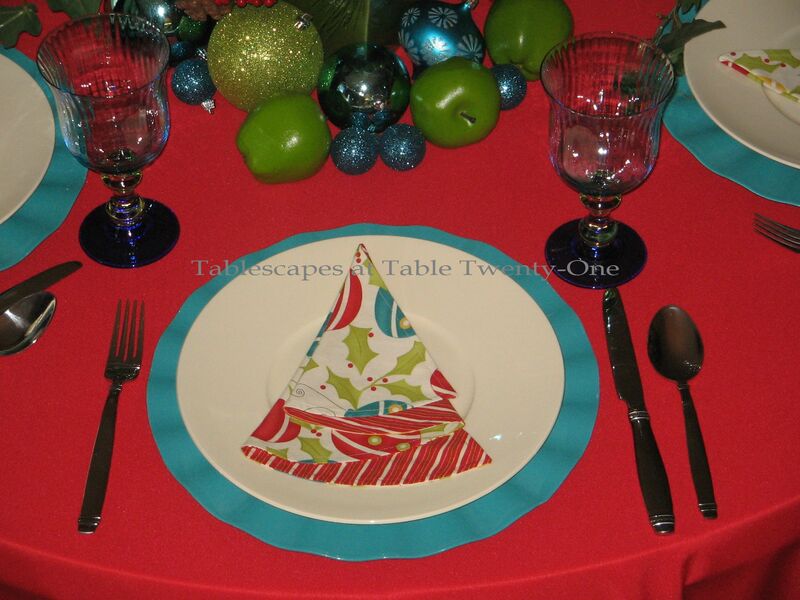 My inspiration for this table is the fun Christmas tree napkin borrowed from my friend, Barbara. It’s packed with both traditional and non-traditional colors in a fun & festive pattern. 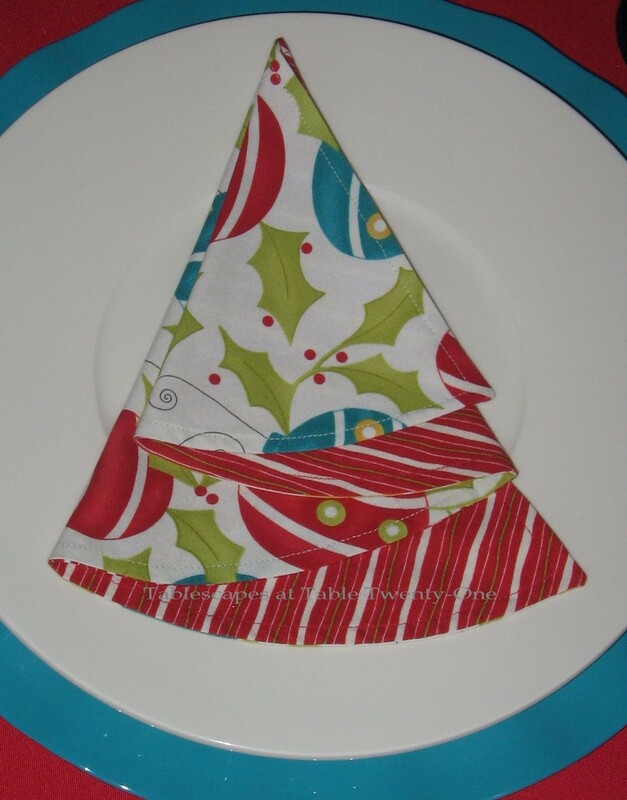 (Click HERE for a video tutorial or look HERE – Tip #31 – for picture and/or video instruction on how to make these fun napkins from a half circle of fabric!) 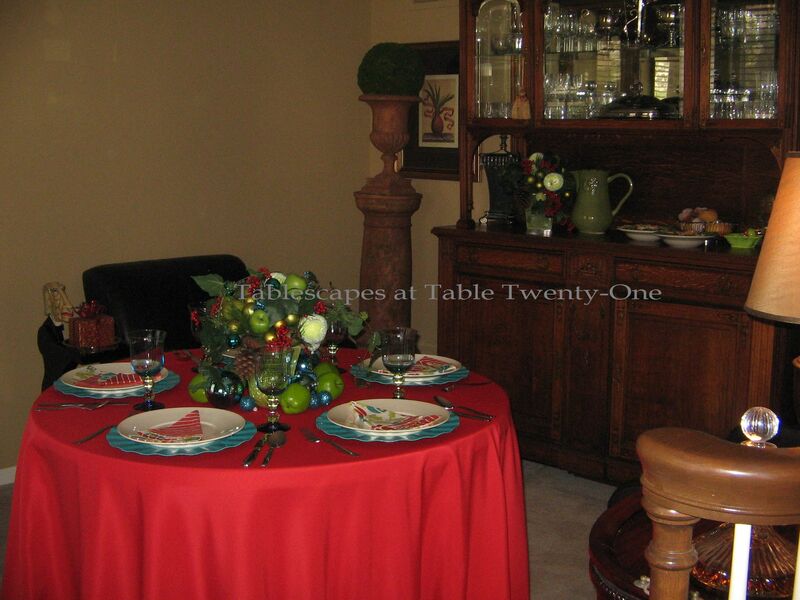 A cheery red full-length tablecloth picks up the red in the napkin, while a modern turquoise acrylic charger from Crate and Barrel serves as ground zero for each place setting. The plates are a creamy ivory stoneware by 10 Strawberry Street. Glassware from Home Goods/T.J. Maxx in turquoise, green and blue works perfectly with the color palette. Stainless flatware is kept simple. 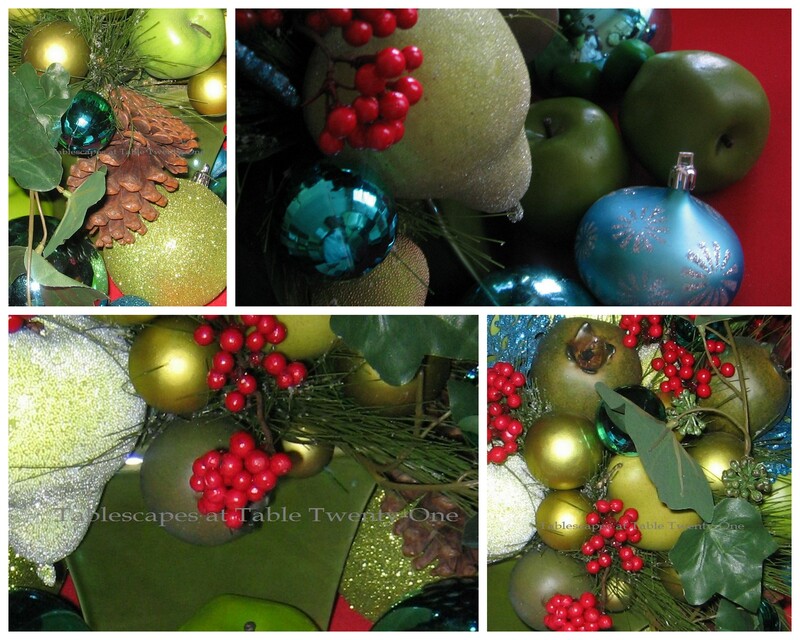 A melange of “sugared” fruits, winter greenery, red berry clusters, assorted ornaments in turquoise and green, and pine cones is assembled in a citrus-green ceramic planter. 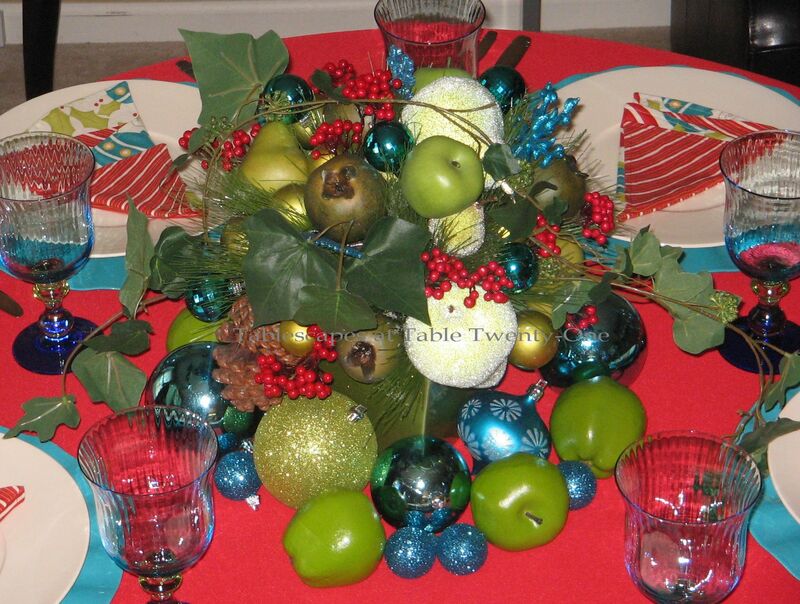 Additional fruits and ornaments are scattered at the base. Lunch is served from the vitrine. Nothing fancy…a heart-healthy salad with grilled chicken strips, assorted whole grain breads, iced tea (but not too much…bathroom breaks are frowned upon once back out there in the shopping trenches! ;-)), and cookies-to-go for dessert. A floral arrangement similar to the one on the dining table graces the corner of the vitrine. Simple and to the point! Now, ladies, it’s time to arm yourselves with credit cards, bail money (just in case things get out of hand out there!) and Depends (remember…bathroom breaks are a no-no! ), and scream that age-old battle cry: CHARGE IT!!!!!!!! Very festive and perfect for those ladies on a mission. Black Friday, you will need some of that “:eat and run” to accomplish your task. Taking the cookies on the run will give those ladies some much needed energy. The napkins are adorable. I have seen those before, but I never knew how they were made. Thanks for the pointer. Congrats on the featured segment on KCTV-5. 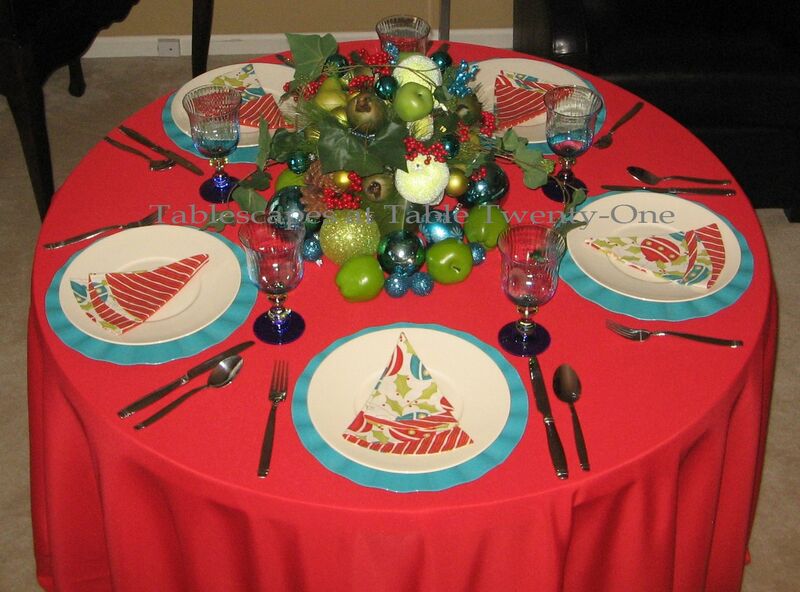 What a festive table…the napkins are adorable. Have fun shopping your heart out, Alycia…there is no way on this earth I would be going out shopping on Black Friday…did it once many years ago, swore I’d never, ever do it again! For whom did you write before you turned to tablescaping? Were you Erma Bombeck’s understudy? The opening two paragraphs brightened my day and shall keep me going throughout the pies, cranberry sauce and 20 trips to the grocery store that I’ll be making today. 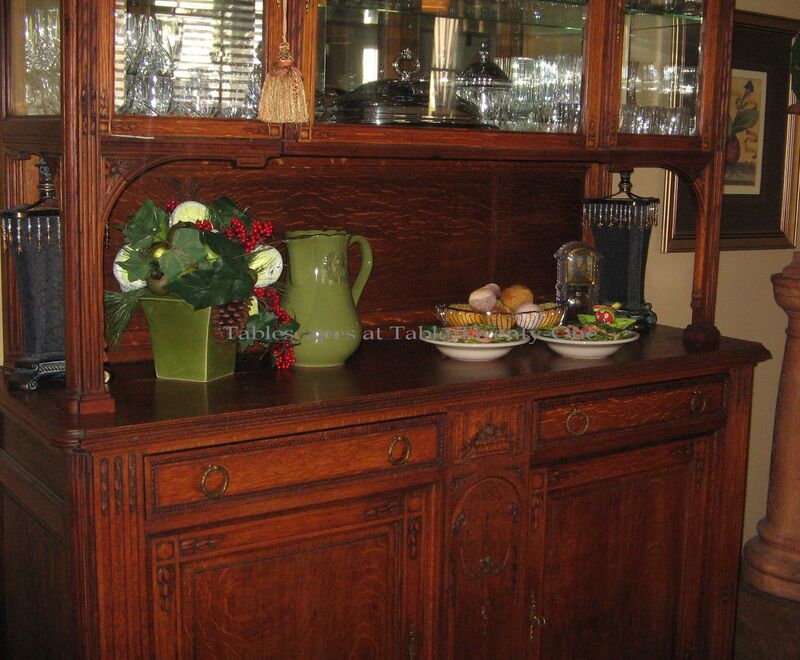 Thanks for your continued talent, both in the dining room and on the written page. I shall make it a point to catch your performance on KCTV-S through the use of their homepage. How pretty ! I have to work Black Friday, I work the night shift at Walmart, so please pray for my safety. Just kidding ! This will be my 3rd. It would be nice to come home after all the “fun” to a table such as this. Looking forward to seeing you on TV ! Dang! Kansas City here I come! I always knew you were a star! Make sure they give you a copy. I do love these colors — I used this color scheme a few years ago, putting my white tree in a big white urn. Hahahaha! Loved it! Especially your ironing tips! I CAN’T iron and I’ve heard there’s a spray on product called wrinkle release…Happy Shopping! Can’t wait to watch that video!!! Great PR for the stylist’s career you are carving out for yourself, girl. Wish I could tune in and see the special! Good for you. Love this fun black Friday table. Have a very lovely and thankful Thanksgiving Alycia! Girl did you make me laugh! This is such a cute table and I can’t wait to see you on TV. On black Friday I will be nestled snuggly on my corner of the couch doing some serious damage to the leftover sweet potato pie and chocolate caramel cake. Wishing you the best! Have you put any thoughts of telling your stories in a book about Tablescaping? I’m with the other ladies that are not black Friday shoppers, I stay FAR away from the stores that day. 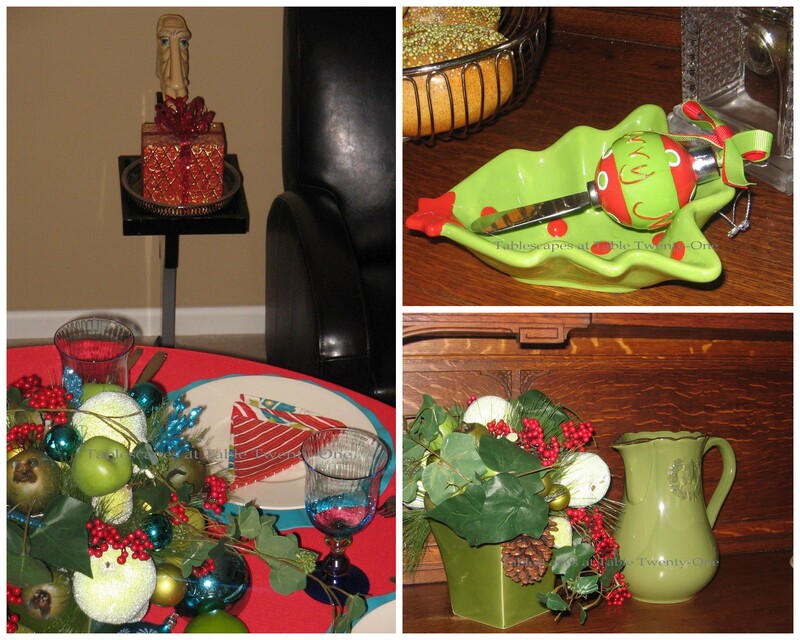 I’ll be working on ideas of my Christmas table, sipping on some hot tea or cocoa. I love the colors you used in this table. This puts a new twist on the traditioanal red/green. My daughter tries to break me away from the traditional every year, she just might see I plan on stepping outside my box this year because of the inspiration I get from you! I love the bright and festive napkins! I think this will possibly be the first Black Friday where I STAY at home! LOL! I think I ‘ll do what Sandra’s doing…..snuggling on the couch and eating leftovers while watching Christmas shows! Oh, I haven’t done a thing for C’mas yet!! Your house looks great, so festive too! I’ve never been soooo very late!! What fun Alycia! I would love to go shopping with you! But, I’m afraid I would get kicked out of your group for having too many bathroom breaks as you would have me peeing my pants all day! I will certainly DVR you on Tuesday! How exciting!!! Alycia~ Those borrowed napkins are wonderful and perfect inspiration for your Black Friday lunching table! My days of Black Friday shopping are behind me when I retired from retail so I’ll be cozily tucked away with my laptop and not battling the crowds! I love your commentary as much as your table you pulled together 🙂 I can’t wait to the see the video of you tablescaping for the holidays from the link you post! Wishing you & your family a Happy Thanksgiving!